Baking with sourdough is never going to be an instant hit, it’s a learning process that once you get, you’ll be addicted to the charm and character of your dough and that final loaf. When I first started my loaves were disappointingly flat and pretty heavy, they are now well risen, lighter and have a delightful open crumb. From what I can gather, this is a combination of how active the starter is, the temperature and time allowed for the bulk fermentation, the flour and shaping of the dough, so basically all the key steps of baking with a wild yeast. I also haven’t bought a loaf of bread since June 2012! 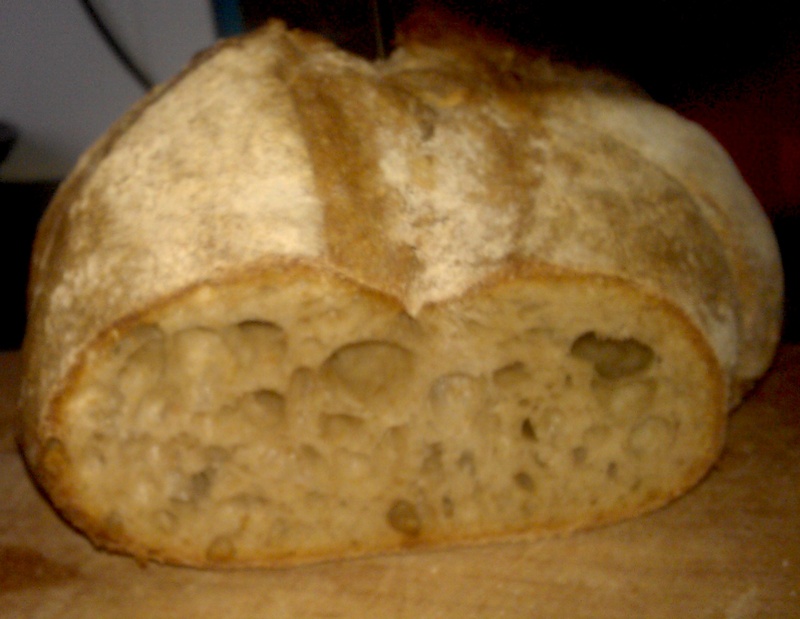 At the moment my first winning loaf is a Pain au Levain recipe with a hydration of 68% (the percentage of water to flour) adapted from Andrew Whitley’s Bread Matters made with a rye leaven. Just under half the dough is made from the leaven so it is quite sour and a cold bulk fermentation is used for three/four days at the bottom of the fridge with a turn twice a day. The rest of the flour is white stoneground organic, so the result is nutty and reasonably light, perfect for spring, wherever it has gone to. I still have a way to go on shaping, which can only be improved by more practice. This recipe is great as you don’t need to be around all the time, just early in the morning and in the evening. The bread will also keep well for a week, if you don’t munch it first. I normally freeze the second one for later in the week or give it to a friend. 1. Feed the starter in the morning to make her super active – equal amounts of cold tap water and flour mix (I keep Bonita in the fridge these days and feed her once every fourth day). 2. Mix 100g starter with 300g light rye flour and 600g water that evening and leave out overnight in a large bowl with a kitchen towel covering it (it needs at least 12 hours to do its thing). 3. 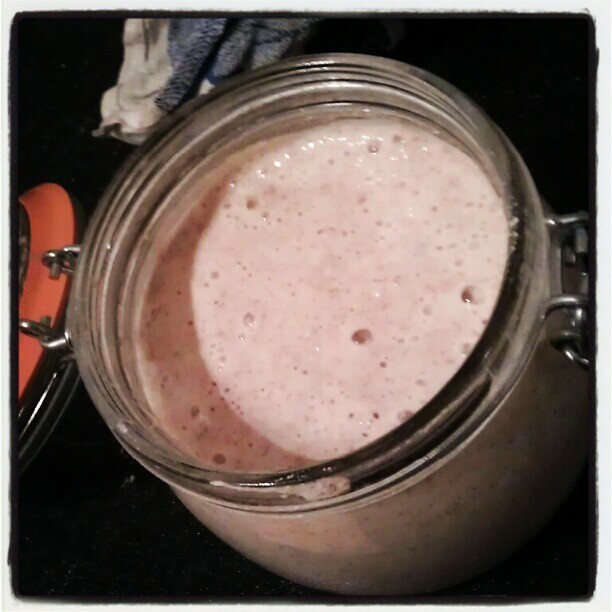 The leaven should be bubbling away. Mix 700g of the leaven with the final ingredients – 850g white wheat flour, 24g sea salt, 230g water. Compost any leftover leaven or make pancakes. 4. Knead the dough without adding any extra flour, for around 12 minutes until it’s smoother and satiny. 5. Shape into a round and oil a large bowl and place the dough in the bowl covered well with a clean plastic bag so the dough cannot dry out. 6. 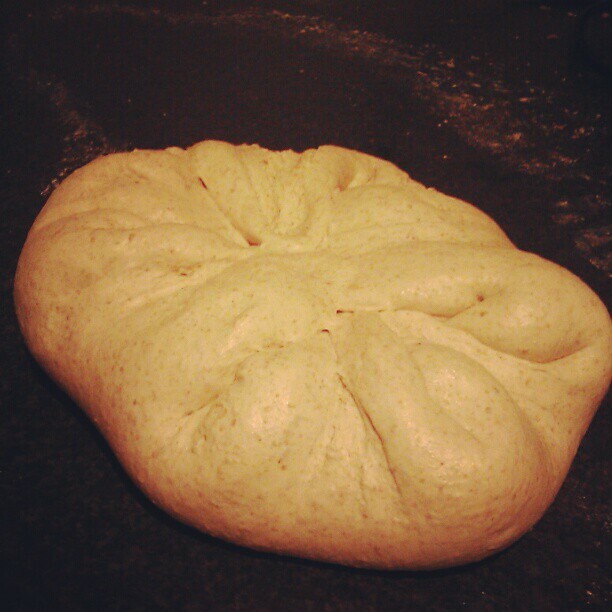 In the evening press the dough out flat and shape firmly into a round and place back in the fridge covered as before. 7. In the morning repeat the above process and again in the early evening if possible, so this is done at least four times. 8. In the evening remove the dough from the fridge to warm up, about two hours depending on your kitchen then divide the dough into two, shape, dust in rye flour and place in proving baskets or a large sieve lined with a cotton kitchen towel or linen cloth. Leave to prove until the dough comes back slowly when poked with your fingertip, between 2-3 hours. 9. Preheat the oven half an hour before baking (220 c) with a baking stone or metal tray on the bottom of the oven. 10. Gently turn out your first loaf onto a well floured wooden board and slash, spray with water and put the loaf onto the stone or tray. After 25 minutes move to the top shelf for another 10 minutes for a browner crust. Leave to cool and enjoy that first mighty slice. Repeat with the second piece of dough. The second loaf is more of a 24 hour loaf with a hydration of 65% which you’ll need to be around the whole day on and off, from Daniel Stevens River Cottage Handbook, a fabulous book as an introduction to baking. I gave my sister the book for her birthday a couple of weeks ago and a bread kit. She’s been baking her way through the book with uni friends queuing up for tastings. This recipe uses less starter than the first loaves and has a less sour taste as the bulk fermentation is done over four hours, a much shorter time, but it’s still a great loaf for a weekend treat, as it’s 100% white flour. 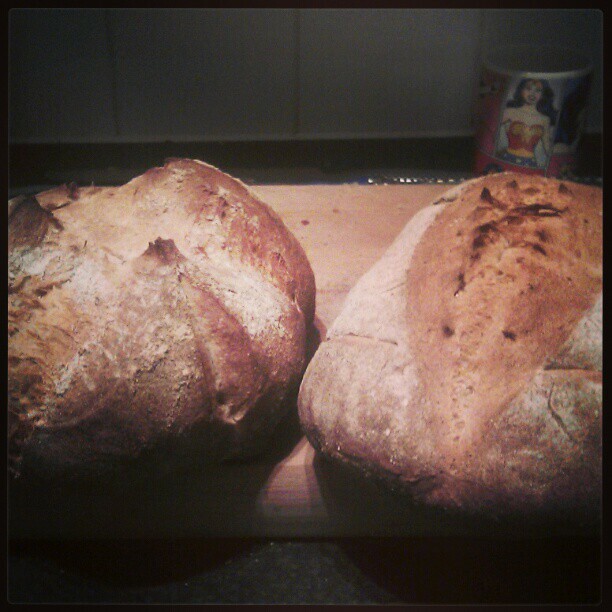 It’s pretty much the same process as the first loaves, but done over a shorter time with a warm bulk fermentation. 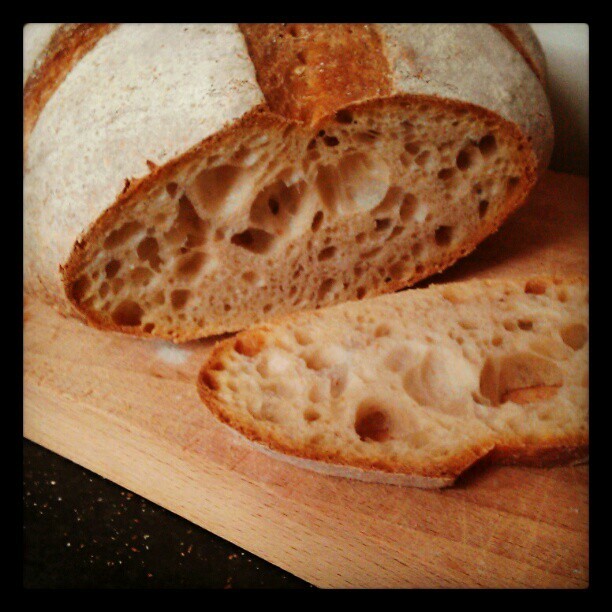 What’s your experience of baking with wild yeast?